Venkaiah Naidu said cattle trade rule was framed with the intent of preventing cruelty to animals. In the backdrop of a raging debate on beef consumption, Union minister and BJP leader Venkaiah Naidu today said food is a matter of choice and he himself is a non-vegetarian. "Some mad people keep on saying such things (BJP wanting to make everybody vegetarian). It is people's choice to eat whatever they want or don't want," Mr Naidu was quoted as saying by news agency Press Trust of India. 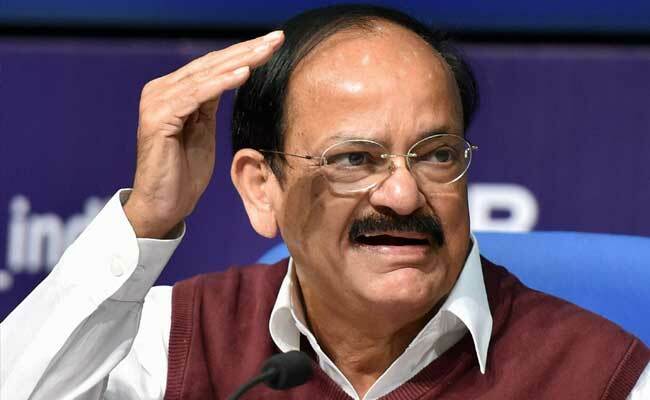 "There was a comment from a political party saying 'BJP wants to make everyone vegetarian' and there was also a TV debate on it," PTI quoted Mr Naidu as saying at a press conference in Mumbai. "I told my journalist friends that I was the state (BJP) chief in Hyderabad and am also a non-vegetarian, still I became the president of the party," he added. Many senior leaders of the BJP, including Prime Minister Narendra Modi and party chief Amit Shah, are vegetarians. PM Modi is also known to fast during Navratras. Food preferences and people's fundamental right to choose what they eat came under the spotlight after the Centre's rules on cattle trade, which banned the buying and selling of cattle for slaughter at animal markets. The Chief Ministers of Bengal and Kerala said the rule was interfering with people's food preferences. Hundreds of 'beef parties' were held in Kerala and Tamil Nadu. Even a section in the northeast, where beef is a staple has grown restive. Two senior BJP leaders in Meghalaya quit the party, arguing that the BJP did not respect the tribal culture where beef is a key part of diet. A petition was filed in the Madras High Court, challenging the rule from the Environment Ministry, which comes under the Prevention of Cruelty to Animals Act. The court, in response, suspended the Central rule and asked the governments at the Centre and the state to respond to the issue. Central ministers, including Mr Naidu, have said interfering with anyone's food was not the intention of the rule from the Environment Ministry. The rule, he had said, was was framed with the "larger intent of preventing cruelty to animals".